Order women’s clothing and casual wear online. Shop tops, tshirts, hoodies, sweatshirts, leggings and pants. Comfort and fashion designs for ladies by many top brands, made exclusively for the McGill University clothing collection. Premium embroidered full-zip hoodie for women with super soft wash. Premium embroidered full-zip hoodie for women with super soft wash. Features a lined hood with drawstring, front pouch pocket, raglan sleeves, rib cuffs with thumbholes and bottom band. Perfect for athletics or just relaxing. Shirt tail length and raglan sleeves make this embroidered women's hoodie cozy and oh so stylish. Shirt tail length and raglan sleeves make this embroidered women's hoodie cozy and oh so stylish. Features hood with drawstring, front pouch pocket and ribbed cuffs. Premium McGill University 2 tone embroidery. UNISEX- Two tone raglan style sweatshirt takes on a vintage look while keeping up with the times. UNISEX- Make a solid statement in this solid classic McGill sweatshirt. UNISEX - Show your love for the iconic McGill's Faculty of Arts Building in a comfortable fleece crewneck sweatshirt. UNISEX - Show your love for the iconic McGill's Faculty of Arts Building in a comfortable fleece crewneck sweatshirt. Made for men and women. Features a v-notch insert at the neckline, rib knit cuffs and waistband, and a McGill University logo screen print. UNISEX - Stay warm and show off your school pride. UNISEX - Stay warm and show off your school pride. This unisex cotton 1/4-zip sweater features two stripes on each arm and an embroidered McGill logo on the left chest. Comes with ribbed mock neck, cuffs and bottom band. Are you a proud McGill mom? Show it with this fleece crewneck sweatshirt. Are you a proud McGill mom? Show it with this fleece crewneck sweatshirt. Features a v-notch insert at the neckline, rib cuffs and waistband, and the McGill Mom logo print across the front. Two tone raglan sleeve sweatshirt will keep stylish and warm. Supersoft heather fleece with ribbed cuff, neckline and hem. Two tone raglan sleeve sweatshirt will keep stylish and warm. Supersoft heather fleece with ribbed cuff, neckline and hem. Two tone premium McGill embroidery. UNISEX - Style and comfort the McGill way. Rep your university in a crewneck sweatshirt with super soft wash.
UNISEX - Style and comfort the McGill way. Rep your university in a crewneck sweatshirt with super soft wash. Features a v-notch insert at the neckline, rib cuffs and waistband, and a premium embroidered McGill wordmark across the front. Premium embroidered women's hoodie with super soft wash. Premium embroidered women's hoodie with super soft wash. Features a lined hood with drawstring, front pouch pocket, rib v-insert detail at the neckline, raglan sleeves, rib cuffs with thumbholes and rib bottom band. Vintage McGill. The classic cotton cable knit sweater arrives just in time for colder weather. The classic cotton cable knit sweater arrives just in time for colder weather. Dress it up or dress it down this McGill embroidered knit features ribbing at hem, neckline and cuffs. UNISEX - Cozy up with this McGill fleece. Full-zip hoodie for women with super soft wash.
Full-zip hoodie for women with super soft wash. Features a lined hood with drawstring, front pouch pocket, raglan sleeves, rib cuffs with thumbholes and bottom band. Premium left chest embroidery. Perfect for athletics or just relaxing. UNISEX - A hoodie for all seasons. This classic goes straight to the front of the class! Rep McGill in a crewneck sweatshirt with super soft wash. This classic goes straight to the front of the class! Rep McGill in a crewneck sweatshirt with super soft wash. Features a v-notch insert at the neckline, rib cuffs and waistband, and a premium embroidered McGill University logo across the front. Mcgill university embroidered women's hoodie with super soft wash.
Mcgill university embroidered women's hoodie with super soft wash. Features a lined hood with drawstring, front pouch pocket, rib v-insert detail at the neckline, raglan sleeves, rib cuffs with thumbholes and rib bottom band. Premium McGill University 2 tone embroidery. Study in comfort. These women's narrow-leg pants are made from super soft fleece, and feature a rib waist with drawstring, cuff bottom, side pockets and McGill University embroidered on the left leg. UNISEX - Love feeling cozy? Then these McGill flannels are what you need to stay comfy and chill while it's chilly out! UNISEX - Show off your University in full comfort. UNISEX - It's a triple threat! Wear different McGill tees all throughout the week with this 3-pack of cotton crewnecks. Proud McGill moms unite! Sport this 100% cotton short-sleeve, crewneck t-shirt. Proud McGill moms unite! Sport this 100% cotton short-sleeve, crewneck t-shirt. Features a McGill Mom logo screen printed on the front. UNISEX - Proud McGill alum unite! Sport this 100% cotton short-sleeve, crewneck t-shirt for both men and women. UNISEX - Proud McGill alum unite! Sport this 100% cotton short-sleeve, crewneck t-shirt for both men and women. 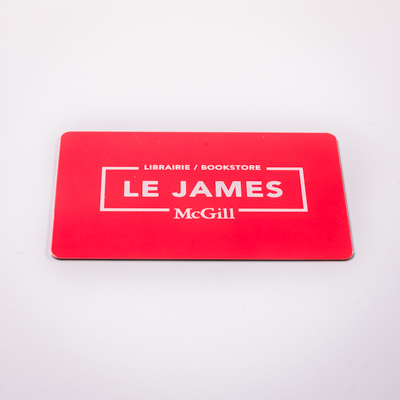 Features a McGill Alumni logo screen printed across the front. UNISEX - Proud McGill grandparents unite! Sport this 100% cotton short-sleeve, crewneck t-shirt. 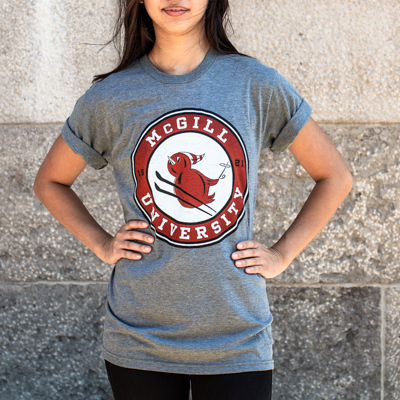 UNISEX - The quintessential McGill t-shirt and a proud symbol for all who went here. UNISEX - The quintessential McGill t-shirt and a proud symbol for all who went here. Short-sleeved, unisex, made from a half-and-half cotton/polyester blend. The University's crest and wordmark embroidered on the left chest adds discreet style. Show your love for the iconic McGill's Faculty of Arts Building! Show your love for the iconic McGill's Faculty of Arts Building! This half-and-half cotton/polyester women's heathered crewneck has short sleeves and a soft handfeel. Lightweight, but fit for fashion. UNISEX- Vintage McGill t-shirt shows our martlett on the slopes. UNISEX- Vintage McGill t-shirt shows our martlett on the slopes. Short-sleeved, unisex, made from a half-and-half cotton/polyester blend. The unique print comes from the McGill library archives. UNISEX - BE A NICE HUMAN for the earth & humanity! This unisex crewneck t-shirt is made out of 100% fair trade cotton. UNISEX - BE A NICE HUMAN for the earth & humanity! This unisex crewneck t-shirt is made out of 100% fair trade cotton. 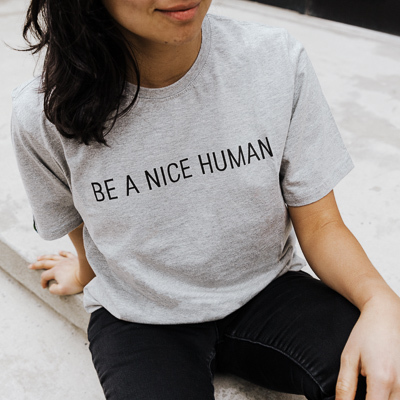 “BE A NICE HUMAN” screen print across the chest. It features the official Fairtrade label on the sleeve and a McGill label on the hem. UNISEX - Show your McGill pride and Montreal pride all at once! UNISEX - Show your McGill pride and Montreal pride all at once! This half-and-half cotton/polyester Russell Athletic crewneck tee has short sleeves and a "McGill / Montreal, Canada" screen print across the front. Keep dry and look cool in this slim fit long sleeve McGill tee. Features ribbed crew neckline and cuffs. Keep dry and look cool in this slim fit long sleeve McGill tee. Features ribbed crew neckline and cuffs. The perfect tee for all activities. UNISEX - You, my friend, YOU MATTER! This unisex crewneck t-shirt is made out of 100% fair trade cotton. UNISEX - You, my friend, YOU MATTER! This unisex crewneck t-shirt is made out of 100% fair trade cotton. A pine tree design and “you matter” are printed across the chest. It features the official Fairtrade label on the sleeve and a McGill label on the hem. 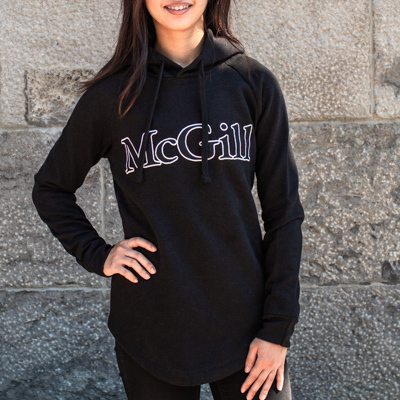 ONLINE EXCLUSIVE - UNISEX - The perfect bundle to show your McGill Pride. Includes McGill cap and McGill t-shirt. The essential McGill "T" will fit you to a tee ! This slim fit and short sleeve crew is perfect for all activities. The essential McGill "T" will fit you to a tee ! This slim fit and short sleeve crew is perfect for all activities. Features McGill University contrasting front print. UNISEX- The baseball tee is back in style on campus. Features heathered contrast coloured sleeves and henley neckline. .
UNISEX- McGill pride and national pride, all in one! UNISEX- McGill pride and national pride, all in one! This black unisex crewneck tee features a large distressed Canadian flag on the front, with the McGill University logo underneath. The quintessential McGill v-neck for any occasion. The quintessential McGill v-neck for any occasion. This ladies tee features a circular McGill University print on the left chest. Show your McGill pride! This unisex crewneck tee features a large distressed rainbow flag on the front, with the McGill University logo underneath. Celebrate Pride in style! TODDLER - A t-shirt for even the tiniest family member! TODDLER - A t-shirt for even the tiniest family member! Toddler size short sleeve tee with ribbed neckline, My first t-shirt from McGill print. 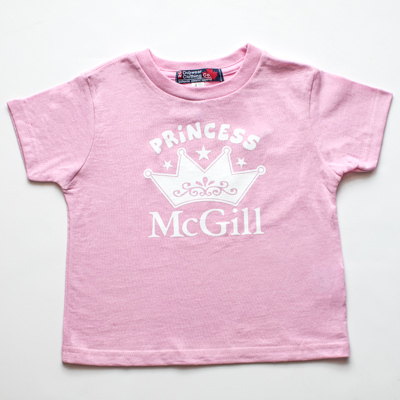 TODDLER - A McGill t-shirt for the tiniest princess. Toddler size short sleeve tee with ribbed neckline, McGill princess print. TODDLER - The whole family can be dressed up in McGill swag. S/S baby onesie with 3 snap closure at the bottom. TODDLER - The whole family can be dressed up in McGill swag. S/S baby onesie with 3 snap closure at the bottom. Somebody at McGill loves me print. 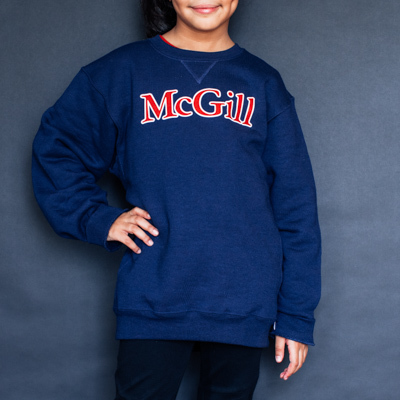 YOUTH - Little ones can rep McGill with their version of our basic tee. 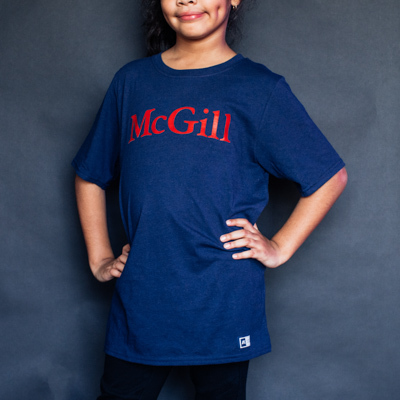 YOUTH - Little ones can rep McGill with their version of our basic tee. The short sleeve crew features a McGill print and will keep them dry and cool. YOUTH - A classic for the future McGill student! YOUTH - A classic for the future McGill student! The long sleeve crew neck features a 2 tone McGill print on the front, ribbed cuff and neckline. KIDS - For the future McGill graduate! Crew neck t-shirt with short sleeves, ribbed neck opening. Class of 20?? Print. KIDS - It's never too early to show your McGill pride. YOUTH - It's never too early to show your McGill pride. YOUTH - It's never too early to show your McGill pride. Our super soft youth hoodie features a lined hood with drawstring, front pouch pocket, rib cuffs and bottom band, and a premium embroidered McGill logo up front.